A brief hiatus in the kitchen from Vietnamese flavours. This is absolutely delicious and incredibly messy to eat. Particularly for those who are bearded. I have adapted a recipe found in an airplane magazine, apparently the original is from Cantina by Paul Wilson. I served this accompanied by skate which had been smeared in ground cumin, coriander and paprika and then barbecued. Peel garlic and chop in thermomix for 5 seconds on speed 5. Add avocado, juice of limes, sour cream, cumin, paprika, allspice, coriander and blend for 10 seconds on speed 7. Scrape down sides and blend for another 10 seconds on speed 7 until smooth and creamy. Dice bacon and pan fry until crispy. Cook corn over a BBQ plate while still in husks. 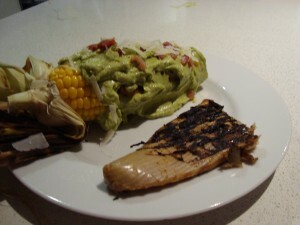 When cooked, peel back husks and roll in avocado crema. Sprinkle bacon and parmesan over the top and serve.